Can you defy Danding and win in Negros polls? NEGROS OCCIDENTAL, Philippines – The country's sugar capital has two questions to answer in the coming May polls. Is it a province that embraces or rejects business tycoon Eduardo "Danding" Cojuangco Jr as its political kingmaker? Is it a province that will prove or disprove the existence of the Catholic vote? The result of the polls will define Negros Occidental to the rest of the country. Elections used to be boring in Negros Occidental. In the past, who will hold what position in government was decided not in the polls but in meetings among members of the United Negros Alliance (UNA), a formidable local coalition led by Cojuangco. They all call him "Ambassador." Founded in 2000, UNA joins together national political parties -- Cojuangco’s own Nationalist People's coalition (NPC), his nephew President Benigno Aquino III's Liberal Party (LP), and Senator Manuel Villar's Nacionalista Party (NP). UNA has since enjoyed near-monopoly of politics in Negros Occidental. Its dominance earned Cojuangco the title as the “political kingmaker” of the province that is not only the base of his business but a province that fuels his influence in national politics. But that title is on the line this coming elections. In an unexpected twist of events, UNA broke apart when Governor Alfredo “Freddie” Marañon Jr and long-time ally and friend Vice Governor Genaro “Lim-ao” Alvarez decided to battle it out for the gubernatorial post this year. Cojuangco’s grip on the province will be measured by the success or failure of Alvarez, his handpicked candidate. Marañon, Cojuangco's former ally, thinks he has grown his own political network that is capable of defeating his patron’s. Marañon is able to keep UNA while Alvarez is running under Cojuangco’s NPC. Both camps formed separate slates out of UNA members who have taken sides. Negros Occidental politics is changed. Alvarez said he cannot understand how Marañon could defy Cojuangco. "It's very strange. I'm even wondering what happened to him," Alvarez told Rappler in an interview at his residence in Bacolod City. "Maybe he thinks he is more than the ambassador, to put it mildly. I have something in my mind but my daughter is shaking her head," he added in jest. Marañon admitted it's going to be an uphill battle, but he vowed to put up a good fight. "We will see if the political machineries work. I believe there is a big change in our electorate. The bulk of our new electors are young people. They are intelligent. They have a mind of their own even their parents cannot persuade them," Marañon told Rappler in a separate interview. Both camps boasted to Rappler they can win by up to 200,000 votes. Marañon doesn't have the machinery of Cojuangco, but he is counting on the equity of the incumbent, the networks he built as governor, and his popularity to win. 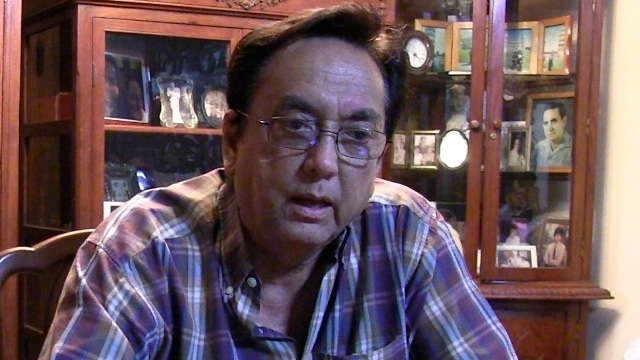 Originally from Tarlac, Cojuangco decided to settle in Negros Occidental when he returned from exile in 1991. It is the province of his wife Maria Soledad “Gretchen” Cuyugan Oppen of the Montinola political clan of Bacolod City. Initially considered an outsider, the former business crony of President Ferdinand Marcos worked his way through the political circles. Awash with cash, Cojuangco supported campaigns and won allies, said journalist Earl Parreño, author of Cojuangco’s unauthorized biography Boss Danding. His political base continued to grow until UNA was formed in 2000 to put all political parties under one group. Cojuangco has his critics, but he is a charmer too. The politicians and his own workers liked him. Parreño said it is because he is very generous and a "cowboy." He easily gets along with people. "All the politicians here in Negros, he treats us very fairly. He doesn’t ask for any favor. What he wants is for the good of the province. I think everybody likes him," said Alvarez. 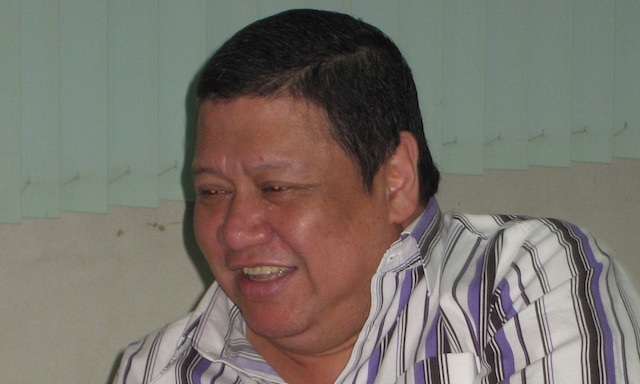 In Boss Danding, Parreño writes: "No doubt, Danding is a complex man. But however one sees him, the reality is that during martial law, he built a business empire so huge that it gave him political as well as economic clout to forge ahead of his rivals." Cojuangco made the 2012 Forbes billionaire's list, which estimated his worth to be US$1.3 billion. He dropped from the list in 2013 after selling his stake in San Miguel Corp.
Controling UNA meant power over local politics in Negros Occidental, the province that contributes over half of the country's total sugar production. 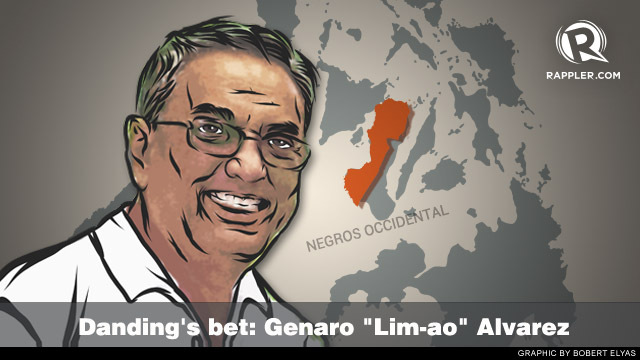 Cojuangco and many of his allies in UNA are owners of vast sugar lands and they make good business exporting sugar to the United States and Europe. Controlling UNA also meant power over national politics. Negros Occidental's 1.6 million voters - the country's 4th biggest voting province - is a bargaining chip he can offer national politicians. "They (senators) are even to the point of begging for the endorsement of the Ambassador," Alvarez said. It is a class of its own. Its 2 senatorial candidates joined opposite camps. Sen Loren Legarda is running under Team PNoy of President Aquino and Cagayan Rep Jack Enrile is running under United Nationalist Alliance (UNA) of Vice President Jejomar Binay. Alvarez confirmed reports that NPC endorsed 7 candidates in Negros. Aside from NPC bets Legarda and Enrile, they are Team PNoy bets Sen Francis Escudero, Aurora Rep Sonny Angara, former censors chief Grace Poe, presidential cousin Bam Aquino, and another UNA bet San Juan Rep JV Ejercito. But busy with their own campaigns, it will be seen if the local candidates can deliver for national candidates as they've had in past elections. Elections in Negros also happens against the backdrop of the controversial "Team Patay" and "Team Buhay" campaigns that the Diocese of Bacolod launched in February. 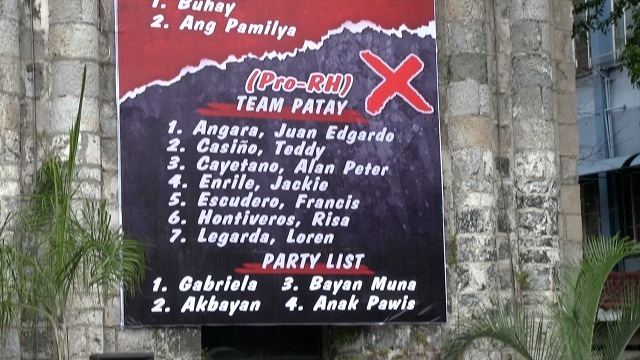 The campaign urged voters to junk "Team Patay" candidates for voting in favor of the law: NPC candidates Legarda and Enrile, Sen Chiz Escudero, Sen Alan Peter Cayetano, Aurora Rep Sonny Angara, former Akbayan Rep Risa Hontiveros, Bayan Muna Rep Teddy Casino. On the other hand, it urged voters to support "Team Buhay" candidates for their position against the law: Sen Koko Pimentel, Sen Gringo Honasan, Sen Antonio Trillanes IV, San Juan Rep JV Ejercito, Zambales Rep Mitos Magsaysay, and former Las Piñas Rep Cynthia Villar. The RH law is measure vigorously opposed by the Catholic hierarchy for funding and distributing contraceptives. The Supreme Court issued a temporary restraining order on the implemenation of the law, however. The campaign inspired similar moves from other diocese nationwide. RH law supporters in Manila have taken the challenge to finally prove or disprove if there's Catholic vote in the Philippines. 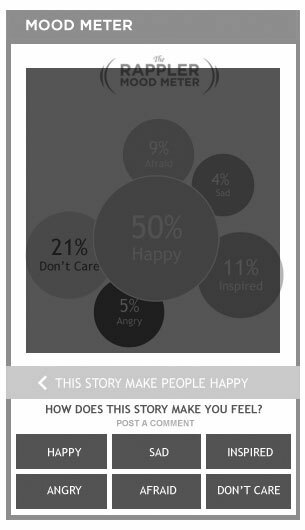 "I hope that they continue that campaign. Let's see if there's really a Catholic vote. I will watch closely what happens in Negros. They raised a challenge. Okay, we accept the challenge," said former health secretary and RH law advocate Alberto Romualdez. Local political consultant and former journalist Mate Espina told Rappler the Church campaign may have impact only in the cities, where the bishops are active. 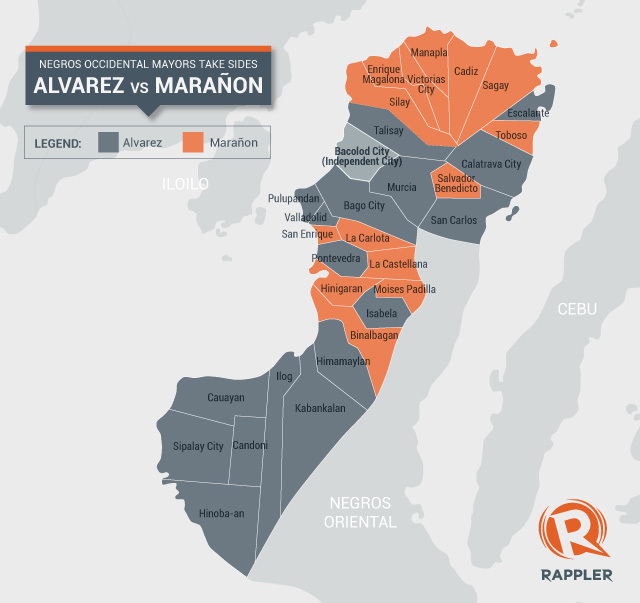 Alvarez and Marañon have taken opposites sides on RH law, represented by the votes of their children occupying seats in the House of Representatives. Rep Mercedes Alvarez voted in favor of the law. Rep Alfredo Marañon III voted against it. Marañon was not unceremoniously junked. Cojuangco endorsed Alvarez after 2 crucial meetings. 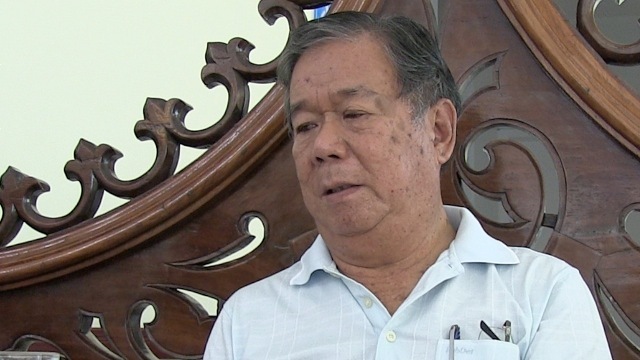 The first meeting was in May with UNA stalwart Rep Alfredo "Albee" Benitez, who told him that mayors and congressmen no longer support Marañon. Echoing sentiments among UNA members that younger politician should take charge of the Capitol, he pushed for Rep Jeffrey Ferrer. But Cojuangco did not like the idea. Benitez is seen as the man who wants to succeed Cojuangco. "I think Albee is interested to be the leader of Negros. I suppose he is very capable. He has the means to support his ambitions. It is really up to the Negrenses. I think nobody can make himself the leader if he is not acceptable to the people that he has to work with," Cojuangco said in a press conference in August 2012 to explain UNA's split. The 2nd meeting was with Marañon himself, who told him he was not going to run anymore. It's a confirmation of a supposed 2010 agreement that he was going to be a "one-term governor." But Marañon would change his mind. Backed by a number of mayors, he announced he's going to run against Alvarez. "Only fools don’t change their mind. Nineteen mayors persuaded me to run. They went to the Capitol. It’s an instantaneous gathering of the 19 mayors and they endorsed me. 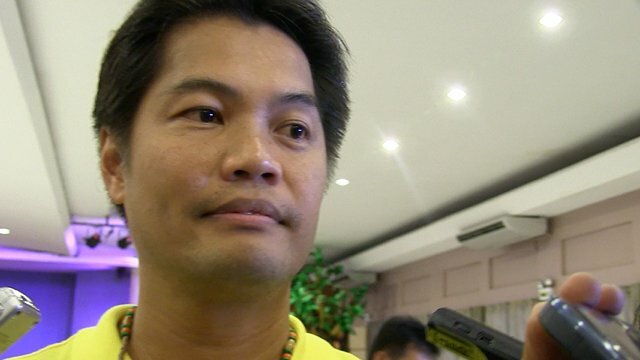 That was the turning point why I decided to run again," Marañon explained to Rappler. UNA would hold more meetings to avoid the face-off. "UNA tradition was that the congressmen discuss with top provincial officials and our founder who to field as governor. Congressmen represent their mayors. During the Manila meeting last August 30, majority of the congressmen agreed to Alvarez," said Rep Mercedes Alvarez. When Cojuangco stood by his decision to field Alvarez, UNA members thought that was the end to the discussion. But it wasn't. Marañon was unfazed and declared he was going to run anyway. A report of The Visayan Daily Star details how Cojuangco and UNA members tried to avoid the split. Confident that the NPC machinery will deliver on May 13, Alvarez said he is going to reunite UNA under his term. "Anybody who wins in this elections will be using the same party for the unification of all parties. If I win, I’ll be using it. Besides it’s owned by the ambassador," said Alvarez. Alvarez didn't plan to run for governor. He claimed he talked to Marañon to settle issues with Cojuangco before they both filed their certificates of candidacies. "I was convincing him to see the ambassador. If the ambassador changed his mind, I was also ­willing to give way. But the problem is I don’t know exactly what was on his mind. It came to a point that both of them doesn’t like to see each other anymore," said Alvarez. Alvarez admitted he cannot win without Cojuangco's endorsement. "I have to be very honest also. I know my limitation. Of course, he is very influential. He is very powerful," he said. And then he joked: "If the ambassador is not helping me, of the 200,000 lead I'm telling everybody here, I think I’ll make only 20,000 margin." Allies in the NPC admit Marañon was initially more popular than Alvarez, who used to lag in surveys. But they claim that their candidate is now the one leading because they've been campaigning for him. "The 6 unopposed mayors have a total vote of about 300,000. I don't see how I can lose," Alvarez told Rappler." Another local NPC stalwart explained Alvarez's advantage through the legislative districts. Negros Occidental has 7 legislative districts. Based on NPC tabulation, Alvarez will enjoy a big win the 1st and 6th districts. The 2nd district will go to Marañon while the 3rd, 4th, and 5th districts will be tight. The 1st district of Rep Julio "Jules" Ledesma IV will supposedly offset Marañon's expected victory in his home turf 2nd district, where son and namesake Alredo Marañon III is the congressman. The NPC is also counting on Alvarez's home turf, the 6th district, to deliver big margins for him to offset a worst-case scenario that Marañon will win in the 3 other districts. Marañon will put up a good fight. 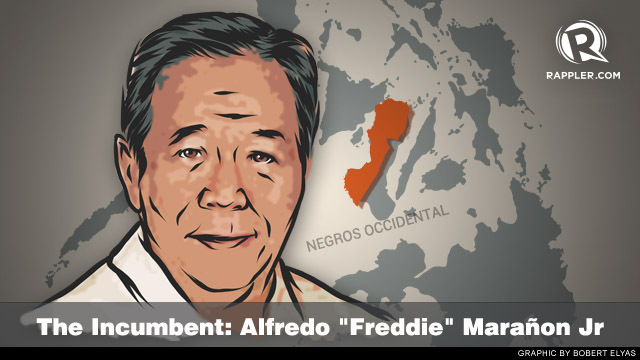 Aside from his 14 mayors (down from the original 19) and 2 congressmen, the governor's old political name still carries weight in Negros Occidental. There was a time when only the old political names were able to enter politics in the province. Before UNA, it was the popular former Gov Rafael Coscuella and his party that ruled politics in the province for over a decade. UNA entered the political arena in 2001 when Coscuella ended his third term. The late Joseph Marañon - brother of the incumbent governor - opened the doors for UNA when he defeated Cosculluela's candidate. Local political consultant and former journalist Mate Espina said UNA's success was a combination of the Cojuangco's money and Marañon's old name and popularity. They were co-equal, said Espina. Marañon was Cojuangco's ticket to the Capitol and vice versa. Joseph would secure UNA's hold on the Capitol for 3 terms. After 2001, he won 2 more elections - 2004 and 2007. But he died of a heart ailment less than a year after after winning the 2007 polls. Cosculluela would attempt a comeback in 2010 against Alfredo Marañon. He gave him a good fight but he lost by 162,221 votes. It was the smallest margin of victory for UNA but it was enough to prove that Cojuangco remains king of the province. Marañon said he is counting on various groups to upset the advantage of Alvarez in terms of political machinery. He enjoys the support of the NGO community. 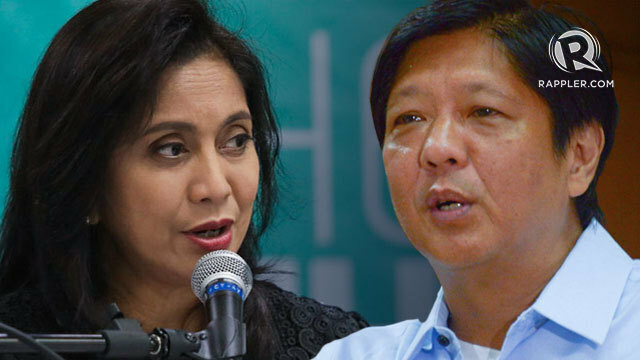 "In terms of alliances among mayors, panalo si Vice Governor. Mas marami ang mayors. 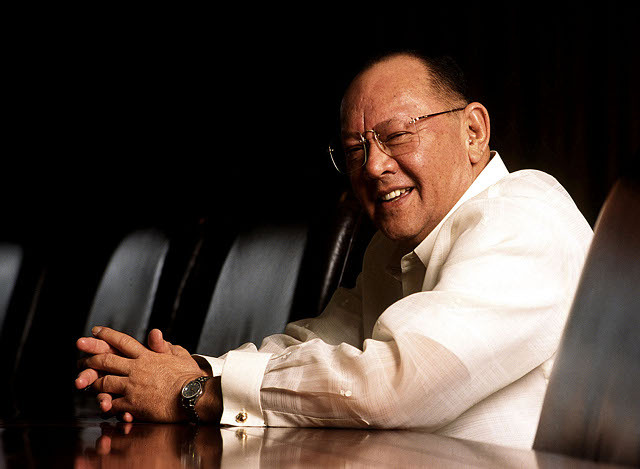 But in terms of sectoral support, it can turn how the votes is going to be cast come May elections," said Espina. He is also hoping to get a share of the "hacienda votes." Sugar planters and landowners are known for their bloc voting. Marañon said he is counting on the groups that supported his brother. Cojuangco's support is a double-edged sword, Marañon added. "There are advantages and there are also disadvantages. Just go around and inquire," he said. 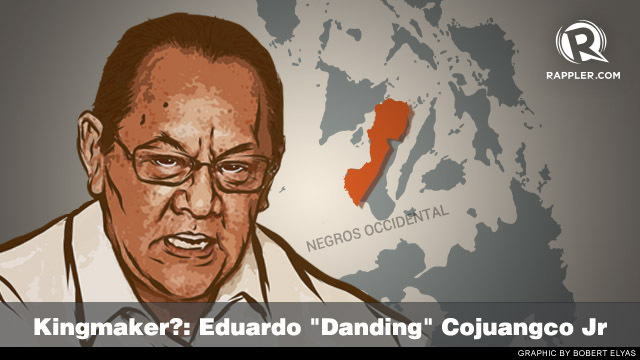 Cojuangco is still regarded as outsider by some people in the province. Marañon claimed he is going to win all legislative districts except the 6th district, the territory of his rival. He got a suprise ally in Rep Jeffrey Ferrer of the 4th district, where Cojuangco's vast agricultural lands are located. Parreño said this is the weaknes in Alvarez's machinery. But Marañon cannot hide his worries. He admitted to Rappler it's not going to be easy. "It’s a big challenge. It’s an uphill battle. But it is the people that supports me -- the grassroots, the religious sector, the fisherfolks, the farmers. Those that have benefitted from my program." To boost his chances, the media-savvy Marañon is taking his campaign to the media. The governor called national attention when he called on the Comelec to put the province under its control. He cited the spate of extrajudicial killings in the province, particular in the Escalante City. Negros Occidental is one of the remaining bastions of communist insurgency in the Philippines. But the Armed Forces of the Philippines and the Philippine National Police dismissed Marañon's call because the killings, they say, are not politically motivated. Marañon resented the PNP response and demanded the replacement of the provincial police chief. He got what he wanted. "At least the leadership of [DILG] Secretary [Mar] Roxas has seen that there is really a need. The previous provincial commander was very biased. It's very clear that he was favoring the other side," Marañon said. But weeks later Marañon said will not push for it anymore. He told Rappler he acknowledges that it is going to be difficult to put the province under Comelec control. Marañon continues to support the victims' call for justice. Marañon's move may be political but he has been a welcome ally to the victims of Escalante City, who have been begging for government attention to the killings there. Escalante City is located in the 1st district, where Rep Jules Ledesma is expected to deliver a victory for Alvarez. Marañon's move may also have something do with the allegations linking the Alvarez family to the muder of Kabankalan Judge Henry Arles. Alvarez's son, Mayor John Paul Alvarez of Ilog town, was tagged by the National Bureau of Investigation as the alleged mastermind. The Alvarez family dismissed the case as politically motivated. Alvarez also dismissed Marañon's media campaign as acts of desperation. "Maybe because he's losing," he said. Still, PNP has augmented its force in the province with an additional one company of PNP Special Action Force. Newly installed provincial police officer-in-charge Senior Supt Ricardo De La Paz said neutrality is the biggest challenge he is facing in the province. "I've been emphasizing the neutrality of our PNP personnel, to always be non-partisan. Our focus is to make that we can deliver to make sure that the electiosn will be secure, fair, and honest ," De La Paz told Rappler. 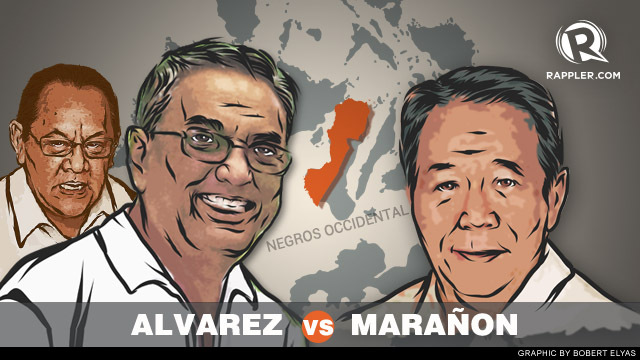 Marañon has no qualms attacking Alvarez, but he is careful when he talks about Cojuangco. "I beg to not to talk about Ambassador Cojuangco. He is not a candidate," he told Rappler when asked about their friendship. He is hoping it will survive the polls. "There’s a political conflict. When we parted, he told me that our relationship transcends politics," he added. In spite of Marañon's attacks, Alvarez also wants to save the friendship. "I feel bad (running against Marañon). I don’t like it. But the problem is I don’t know if he likes running against me because he’s supposed to quit," he said. Negros Occidental, the province they are fighting control of, is home of country's richest hacienderos and politicians, but is also a home to a many poor Filipinos. Government's data shows a poverty incidence of 34.2 % in the province in the first semester of 2012. Two of its cities - Sipalay and Kabankalan - are also among the poorest in the country. Are there prospects of life getting better for Negrenses under whoever wins as governor?